After having successfully survived eating year old home-made hardtack, I was psyched to see that Jas. Towsend and Son had a new series for me to try: preparing and cooking parched corn. Parched Corn, like pemmican and hardtack was a super-food in its day. Not because of it was so nutritious or tasty, but because it was cheap to make, relatively nutritionally dense, quite portable and had a long shelf life. 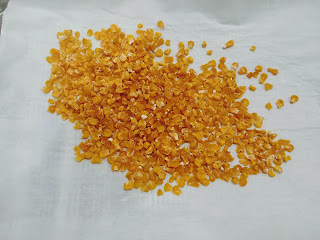 Botah Kapussa (Cold Flour) : Shell corn from the cob when the grain has reached the stage where it is firm but not dry. 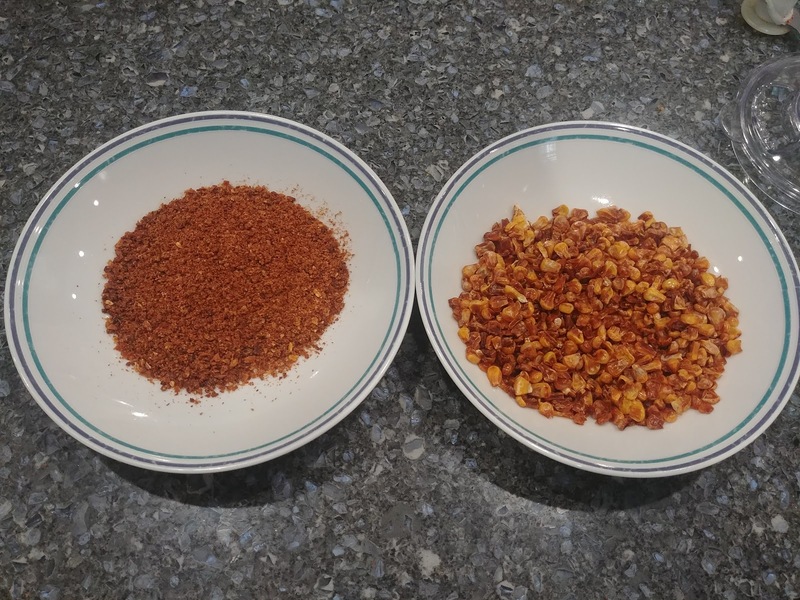 Place the shelled corn in a large pot of hot ashes, keeping the pot over coals of fire until the corn is parched a golden brown, in the meantime stirring the grain to keep it from scorching. Put the corn into the fanner, and clean off the ashes. Next pound the corn in the mortar until the husks are loosened. Again clean out the husks from the grain in the fanner. Beat the clean corn into flour in the mortar. This parched corn flour may be sweetened with enough sugar to taste. Add enough water to dampen a small serving, and eat as a cereal. A small amount of botah kapussah will go a long way as food. In tribal times, the Indian hunter took a small bag of this unsweetened food with him on long expeditions, often traveling many days with nothing else to eat except botaic kapussuh, a little at a time generally mixed with water. This cold flour was a boon on a long hunting expedition because a small amount was nourishing, and a bag of it was light and easy to carry. Tales like these had me convinced: I needed to parch some corn, and perhaps add it to my hiking / backpacking diet. Parching corn didn't look that hard, you take dry corn, toast it and then grind it up. But where does one find dried corn? Fortunately, I found this citified recipe on the web. 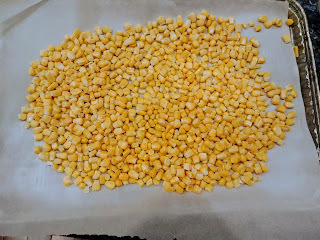 It called for taking frozen sweet corn, dehydrating it, and then tossing it into a frying pan to parch it. So that's what I did. While dehydrating took hours, it wasn't really a lot of work. What was surprising was that when I was done, the dehydrated corn was pretty much inedible. This wasn't looking so promising. I then grabbed a frying pan, sprayed a bit of olive oil Pam in it (probably too much) and dropped in some dry kernels. I then turned on the heat and waited. That was a bad idea, because I definitely ended up over-cooking the first batch. But once I got the hang of shimming the pan around, I could see how you could toast the corn without burning it. Over the next couple days I noshed on my creation. I mixed boiling water with the powder to make a sort of sludge, while the larger kernels I just ate by the handful. 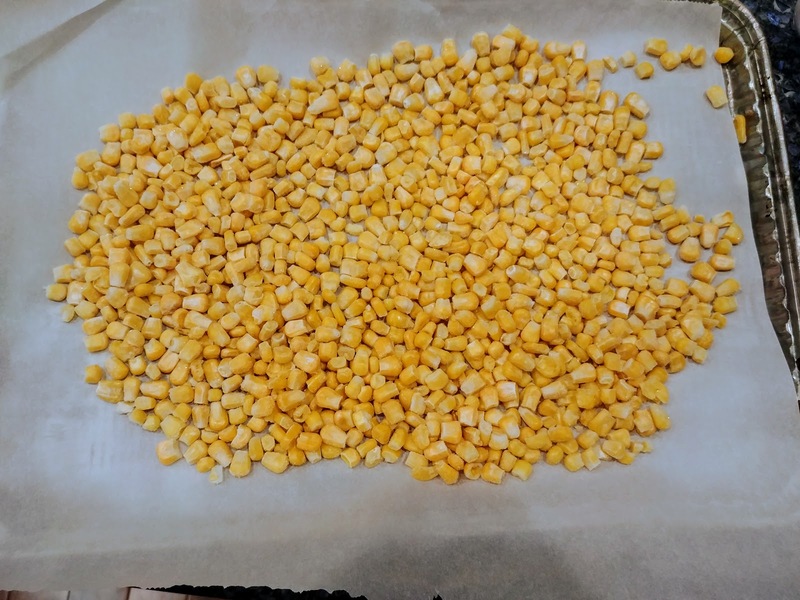 The good news is, parching the corn made the inedible dehydrated kernels quite edible. And they were nice and dry (minus any extra olive oil), so I could see how this could resist spoilage. In terms of taste, it was OK. The sludge was definitely palatable, and if I were eating it at the end of a long day of hiking, I'd have rated it a 10 out of 10. But in my kitchen, it was just OK. Nothing special. It was like eating toasted corn sludge, which of course, is all it was. Snacking on the larger kernels grew on me. Again, they weren't heavenly, but I could totally see paying a ridiculous sum of money at Whole Foods for the privilege of buying a bag of this stuff. Will it get added to my backpacking menus? Hard to say. But I can report that this was an awesome culinary experiment and recommend you try it. That, and I have even more respect for the Indian hunters who lived off a handful of this stuff a day.